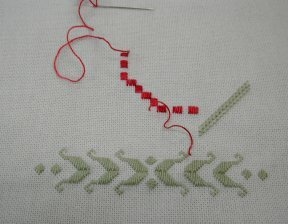 Rosemarie's Hardanger Bell Pull - Progress?? On Saturday we only had a small class, so after they all were stitching, I thought I might get a few more stitches into my Bell Pull. 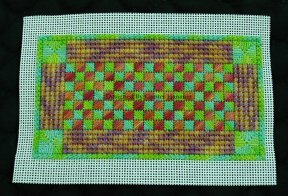 I started on the main element for the Summer part of the design, the Primke perle 8 I had picked really worked well with the background fabric and seemed to reflect the feel of our hot summers. Then I had a really good look, and found that I had lined up one ship motif to the right of where I should have, so now I am reverse stitching instead. Well here is the photo before I started reverse stitching, I still like the colours though. Gunter has designed another phone pocket using Primke threads, this is again worked on 18 count canvas in 2 different colour ways. Below is the photo of one colour way almost finished, then we really must get on and finish the instructions for both sets of phone pockets. By the way mine is working out fine and it is getting lots of use and comments, this could be something to make for yourself or as a Christmas present. Well here as promised are the first stitches on my New Hardanger Bell Pull, even though I have still not finished the Myreshka doily I just needed to start this. What's stitching if you don't have at least 2 or 3 projects on the go. 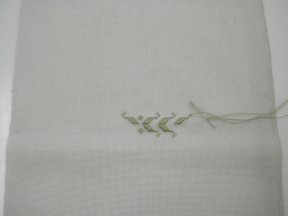 Monika has dyed this piece of Lugano for me and it is a pale shade of 'Dirty', Sage Green and DMC 542 works well on it. I am also going to use some overdyed threads and it is going to have Spring, Summer, Autumn and Winter panels.